Join us for Celebration Sunday on April 28th! Exciting things are happening at Prince of Peace! We're embarking on a building project! This opportunity is a wonderful gift from God. We've been blessed with an opportunity to GROW so we can continue to GO into our community and proclaim the life-saving message of Jesus. Learn more about the purpose and vision behind our expansion, our progress, and how you can get personally involved in our plans. See renderings, read about our future plans for the expanded facility and our growing congregation. Learn more about our goals and the progress we've made so far! Giving expresses our gratitude to God by using His resources to continue telling His story in our community and world. A unified campus will give our ministry a vibrant flow. Visitors will easily see that Prince of Peace is all about Jesus! This new facility will provide over 3,000 additional square feet of space, 228 worship seats, and 7 classrooms to support Christian education. A beautiful, new exterior will reflect the glorious message that is shared inside every day. 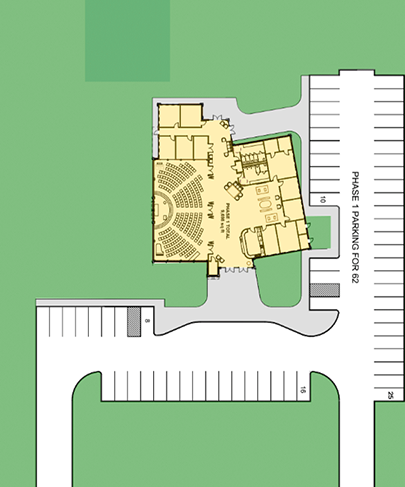 New facilities will eliminate ongoing maintenance issues and allow the congregation to focus on growing ministry. Our goal is to raise $4 million dollars for the funding of this project in addition to regular offerings. Yes, this is BIG! But remember, our God is even bigger. The Lord our God has big plans for our little congregation in Flower Mound, Texas. He cannot and will not be boxed in to our simple human expectations. Let us follow Him with confidence as we lean on the sure promise that He will provide all we need. Stewardship isn’t about what we give, but what about what God has already given. As you consider your gift, remember HIS gift! Note: Prince of Peace pays a 2-4% surcharge on all credit and debit card transactions.